Published: Oct. 15, 2016 at 11:41 a.m. Updated: Oct. 16, 2016 at 12:33 a.m.
Editor's note: In this space we'll track the top 10 players in college football (based on NFL.com analyst Chad Reuter's rankings) through the seventh weekend of the season. Here you'll find each player's final stats and analysis of their performances. The post will be updated throughout the day as games conclude. All times listed are Eastern. Week 7 stats: 13-of-26 for 181 yards, 1 TD. 21 carries for 144 yards (6.9 average), TD. Reuter's analysis: Jackson took the team 80 yards on the opening drive, and the Blue Devils looked like they were overmatched. Duke brought pressure later on, however, and Jackson struggled with it. His accuracy was inconsistent even when his feet were set. Jackson made a couple of nice seam throws, but more often short-armed or sailed passes and led receivers out of bounds. He also had a tough time with touch on shorter throws, trying to silence that cannon on his right shoulder. Jackson was lucky he wasn't intercepted in the end zone late in the game, showing poor decision-making in a crucial situation. In the end, he was able to help the Cardinals win by pulling out some magic in the backfield, avoiding tacklers and using his elite speed to move the ball on the run. Week 7 stats: 14-of-26 for 154 yards, 0 TDs, 2 INTs. 11 carries for 83 yards (7.5 average), TD. Reuter's analysis: Kizer did more damage running than passing in the first half against the rival Cardinal. He's not as fast as Lamar Jackson or Jalen Hurts, but he's strong and effective. He made bad decisions from the pocket, however, in the second half. The redshirt sophomore held onto the ball too long in the pocket a couple of times tonight, and threw two interceptions in the middle of the field -- one underthrow and one overthrow, both with poor footwork. He was benched for Malik Zaire after the second interception, but returned to run the four-minute offense at the end of the game. Kizer showed great maturity by not pouting after the benching, and made precise throws on the last drive -- but his youth showed again by taking a sack and then failing to get the ball into the end zone on the final play. The Irish's disappointing season continues. Week 7 stats: 39-of-52 for 378 yards, 2 TDs, 1 INT. 13 carries for 35 yards (2.7 average), TD. Reuter's analysis: Watson struggled with accuracy throughout the first half, overthrowing passes, short-arming a checkdown pass, and putting back-shoulder throws too far inside, allowing defenders to get into the play. On the opening play of the second half, Watson intended to connect with a receiver running a hitch after a fake handoff. He failed to see an underneath defender waiting for the throw on the play, resulting in a pick six. He rebounded, though, flashing throughout the second half by showing great anticipation and tight spirals. While it wasn't a clean performance by any means, Watson once again overcame early inconsistency by showing the mental toughness to get over mistakes and make plays in clutch spots. Coaches will appreciate that attribute. Watson's downfield touch is an issue. Week 7 stats: 11 tackles (2 for loss; .5 sacks), 1 QB hurry. Reuter's analysis: McDowell often lined up outside on Saturday (vs. the left and right tackles). He used his quickness off the ball to knife into the backfield and frequently kept plays from bouncing outside, using his excellent length and athleticism. He chased down Northwestern running back Justin Jackson on a pitch play, showing great speed for his size; McDowell was injured on the play but quickly returned to the game. He also played over the guards or center during the game, taking his man into the backfield on more than one occasion. Northwestern neutralized him enough, though, through double-teams and running plays away from him, to put up a 50-burger against the Spartans. Week 7 stats: 11 tackles (1.5 for loss), 1 forced fumble, 1 fumble recovery. Reuter's analysis: LSU's defensive leader again showed off his ability to make plays around (and behind) the line of scrimmage. Adams stopped runners in their tracks before they were able to get past the second level, and also exploded through trash to blow up stretch plays. In fact, he caused a fumble in third quarter on a run play that resulted in a scoring drive for the Tigers. From there, LSU rolled. Adams was a difference-maker. Reuter's analysis: Robinson struggled with the speed of Tennessee in the first half, but he won the war in Alabama's rout of the Volunteers. He slowed down Derek Barnett and others initially, but failed to stay engaged with active feet to prevent the secondary rush. He gave up a strip-sack to Barnett on that sort of play. Barnett and others might have been worn out by the end of the game, however, as Robinson was able to stick with the junior pass rusher around the pocket to negate him. On run plays, Robinson was effective all day, even though the Tide didn't run the ball as much as it could have. His strength won out over the Vols' quickness. Cam Robinson not able to handle speed of Tennessee. He gets the initial punch but can't stay engaged...this has been my concern all year. 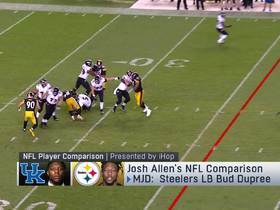 Reuter's analysis: Allen didn't make any huge plays Saturday, but his coaches didn't have to worry about him being out of position, either. He stood up to double teams regularly while also attacking gaps when the defensive call required him to. Allen's was also excellent when moving down the line to chase plays. He continues to prove to scouts that he could play the five-technique or three-technique at the next level. Week 7 stats: 2 tackles, 1 INT (returned 39 yards for TD). Reuter's analysis: Teams really don't want to throw in Tabor's direction, which is part of the reason why his teammate and fellow corner, Quincy Wilson, has been so productive. Tabor showed why teams don't want throw to him, getting a pick-six vs. the Tigers by jumping a late throw to his side as his receiver slipped, and taking it to the house. Though he gives up a few inches in height to receivers, Tabor proved again today that he's willing to mix it up at the line of scrimmage to knock his man off his route. He stayed in phase with his man consistently, as well, making it difficult for Missouri to move the ball through the air. Week 7 stats: 25 carries for 115 yards (4.6 average). 1 catch for 11 yards. Lost 2 fumbles. Reuter's analysis: It was the best and worst of times for Cook against Wake. He ran for a lot of yards, slashing through holes. In fact, Cook was so effective at times that FSU took advantage of him as a decoy by the goal line, leading to an easy touchdown run for quarterback Deondre Francois. It wasn't a perfect day for Cook, as he was shaken up twice on plays in which he fumbled. He was also overwhelmed in pass protection at times. Cook fought through the issues to carry the mail, however, helping to secure the win. Reuter's analysis: Williams started strong, throwing down Tennessee quarterback Joshua Dobbs on third down to force a punt on the opening drive. At times, his power and spin moves allowed him to get pressure on the quarterback. Williams ended up on the ground regularly, though, limiting his ability to make plays throughout the second and third quarter when the outcome was still in doubt. So, while he still shows great promise, Williams' inconsistency as a playmaker might worry teams. Week 7 stats: 12 catches for 146 yards (12.2 average), TD. Reuter's analysis: Williams has loads of talent, and it showed against North Carolina State. He struggled against the physicality of the North Carolina State corners early on, failing to bring in contested passes. But he came back to win those battles later in the first half. For example, Williams used his body to shield his man away from the ball on a much-needed touchdown. Only a blocked field goal prevented N.C. State from scoring off of a Williams fumble in the third quarter, but his strength on routes and after the catch led to important yards for the Tigers in the second half. Reuter's analysis: The Irish's left tackle played well Saturday night, using his strength and athleticism to keep the pocket clean. McGlinchey is able to keep his knee bend and lateral movement through contact, staying with pass rushers throughout a play. His footwork to the second level is also very good. McGlinchey also pushed the line when the Irish chose to run the ball, showing that he can do anything a coach could want a tackle to do. Despite Notre Dame's struggles, the junior is showing scouts he's a future NFL starter. Week 7 stats: 7 tackles, 3 pass breakups. Reuter's analysis: The Sooners' top defensive back was once again physical and heady against Kansas State. He nearly came up with an interception in the end zone, staying with the WR while he worked to get open and finally knocking away the pass as it arrived. In the third quarter, Thomas let up on one play, allowing his man to get behind him while his quarterback scrambled, resulting in a long touchdown. He came back for a another pass breakup later in the fourth quarter, leaping and getting full extension to knock away a pass. That's the sort of play in coverage that scouts will hang their hat on when pressing their general manager for his selection whenever the junior enters the NFL. Dropped out: Stanford RB Christian McCaffrey (No. 10 last week); Florida State S Derwin James (knocking on the door last week).